In our overview of Flat Roofing Technologies: Part I – BUR, Tar & Gravel and Modified Bitumen, we discussed the older and in many ways inefficient types of flat roofs, that are not only outdated by today’s standards, but also have a short life cycle expectancy. Moreover, they pose numerous obstacles when it comes to repair, as discussed in our Flat Roof Repair guide. In Part II, we will take a look at the newer, more advanced roofing technologies, and explore the advantages and disadvantages of each single-ply roofing technology commonly used today. What is single-ply flat roofing? There is a lot of confusion about single ply membrane roofing. Many people think that any ‘single ply’ is the answer to their flat roofing problems. This however is far from being the truth. In reality, single-ply roofing membranes have only one thing in common – that is: they are single ply, or just one layer of membrane that is a waterproofing barrier. The similarity stops there. Membrane formulation, or the components a membrane is made of, marks the biggest difference between different single-ply products. Single ply membranes come in various widths, ranging from 6 to over 18 feet. In theory, the wider the membrane is, the less overlapping seam you have, thus reducing the possibility of leaks. The reality is different however, and most commonly used membranes do not exceed 10 feet in width. The most crucial aspect to the reliability and longevity of single ply roofs is the method of attaching overlapping seams together. That is where 99% of flat roof leaks occur. Therefore, having permanently attached seams is the most important factor in the longevity of a flat roof installation. We will discuss it in more detail as we review different single ply roofing technologies. Single ply membranes are installed either as fully adhered or mechanically attached systems, depending on each roof’s condition, installer’s preferences, and other factors. Underneath the membrane, there is usually a separation barrier and/or some sort of insulation board. Most common insulation is ISO or EPS foam board. Both types have an R-value ranging from 4-R to 6-R per 1 inch of insulation thickness. Mechanically attached installation uses heavy duty screws and barbed plates to hold the membrane down tightly, and is not affected by possible ISO de-lamination. The membrane is attached using 12″ O.C. pattern with perimeter sheets attached 6″ O.C. This ensures that even the hurricane-type wind will not tear off your roof. Mechanically attached installation method does not require the use of heavy and expensive ballast, and is a preferred choice, if your building is located in a high-wind area, such as along the coast line or on a high hill. 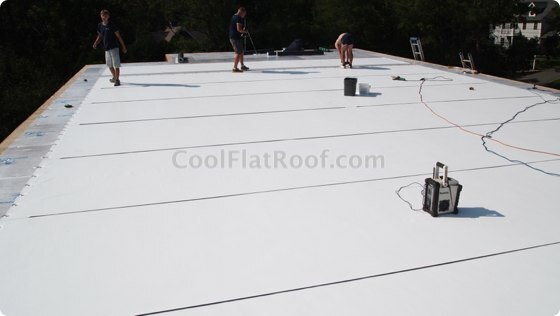 Fully adhered single ply membranes are glued to the fiberglass sheet, laminated to both sides of the ISO insulation, which is in turn attached to the roof deck. While quick and simple, the fully adhered method has one serious disadvantage. If condensation forms underneath a roofing membrane, which often happens and may be caused by improper ventilation of the roof deck, it will ‘de-laminate’ the ISO board and/or adhesive that is holding membrane in place. If the membrane becomes loose, it is prone to wind blow-off, which will leave your roof unprotected. Results of such blow-off will be catastrophic not only to your roof, but to the entire building. While this is rarely the case, it is still a possibility – a gamble you might not want to take. 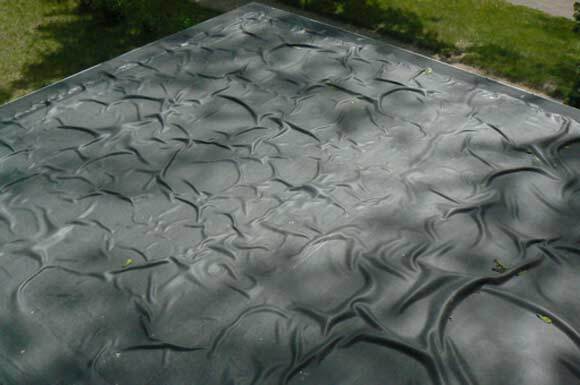 More common problems with fully-adhered single-ply flat roofing systems (Mostly EPDM rubber) are defects in glue/adhesive application that cause bubbles, badly glued seams and as a result, a very unpleasant view and more often then not, roof leaks. The image bellow demonstrates a defective EPDM rubber application. Find out more information on why you should avoid installing EPDM rubber roofing on you home and how residential roofing contractors are trained to install rubber roofs. Today, when it comes to flat roof replacement, single ply roofing is the top choice. More and more contractors are switching from old systems, such as BUR, Asphalt, and Tar & Gravel to single-ply membranes, which are easier, safer and faster to install. Single ply roofing installation does not require torching, used in Modified Bitumen installation, and therefore there is no fire hazard/possibility to burn down your home / business. There are 3 most-used single ply membrane systems present on the market today: PVC/CPA, EPDM rubber and TPO. Bellow, we provide a brief summary of each of these systems. PVC – Polyvinyl Chloride – a thermoplastic membrane, utilizing a reinforcement scrim between the two plies of equal thickness (IB roof only). Top ply contains Cool Roof pigments, UV stabilizers, and other components to extend the life of the membrane. Bottom ply contains PVC ingredients to provide consistent weld of top and bottom plies and fillers. Material Warranty Period: Up to 25 years Commercial / Lifetime Residential. PVC life expectancy: 30+ years. The reason for PVC’s superior durability and longevity are the seams, which are hot air welded and as a result will be impervious to leaks and will never come apart. Special Notes: For a complete overview of IB flat roofing products for residential, commercial and restaurant use, as well as installation method and roofing accessories refer to our IB Roof products page. Learn more about IB’s outstanding single ply flat roofing membrane, its advantages, and many choices for Residential, Commercial and Restaurant use. TPO – Thermo Plastic Olefin – a thermoplastic membrane utilizing a reinforcement scrim between the two plies. 35/65 % thickness for top & bottom ply respectively. Top ply contains Cool Roof pigments, UV stabilizers, and other components to extend the life of the membrane. Bottom ply contains TPO ingredients to provide consistent weld of top and bottom plies and fillers. Note that the top ply is about half the thickness of the bottom ply. Yet, the top ply is the one that makes the roof long-lasting. IB PVC has a 50/50 or equal thickness of top/bottom ply. Material Warranty Period: Up to 20 years Commercial / None for Residential. TPO roof system life expectancy – 7 to 20* years. Like PVC roofs, TPO systems also use the hot air welded seams technology to make the roof durable and leak free. However, problems with the membrane formulation, are a source of many issues. You should know that there is not a single TPO installation in existence in the USA, that was produced in North America and is older than about 15 years. Therefore it is unknown how long a TPO system will perform without any leaks*. Special Notes: * TPO roof systems are under continuous development by numerous manufacturers, who constantly change the TPO formulation to achieve the lowest cost with acceptable performance. While it is understandable that businesses always look to save money and to reduce costs, this ongoing TPO development process is being conducted, often at the expense of the roof owner. A TPO roof from the same manufacturer will most likely NOT be the same as the one produced a few years before or after. Also, the quality of different batches of TPO membranes may be questionable, as some TPO producers release the product to the end user without getting the UL and similar approvals/certification, as the formulation changes too often. Refer to our comparison article of PVC vs. TPO to find out more about the TPO problems / short-comings. EPDM Rubber – Ethylene Propylene Diene Monomer – a rubber-like black membrane, usually non-reinforced. Most common application method is a fully adhered (glued down) membrane with glued seams / flashings. Material Warranty Period: Up to 40 years Commercial / None Residential. EPDM roof system life expectancy – 10 to 15 years. Although the material warranty goes up to 40 years for a 90-mil Epdm from some manufacturers, it does not cover the seams. Failing seams are the main cause of EPDM roof leaks, followed by ponding water, for which EPDM has no warranty either. Special Notes: EPDM is the least expensive single ply roofing type and requires no special equipment to install it (unlike PVC and TPO which require hot-air welding equipment) and thus is the first choice for contractors entering the flat roofing market and asphalt shingle roofers, who ‘install rubber here and there’. Although many commercial roofing companies also use EPDM, they usually do not perform Residential installations so many times a home owner deals with a Part-Time flat roofing company. Please note that there are many manufacturers of all three types of roofing, and each has their own formulation / manufacturing process / warranty conditions and periods, etc. Therefore we only provide a general summary for each of those roof types. Also, since our specialty is installation of IB roofs, when we use the term PVC or CPA we refer to IB PVC Roofs (CPA or Co-Polymer Alloy is the way IB Roof Systems refers to its PVC product. IB membranes are 100% ‘compatible’ with other PVC products). We have an old 6″ kitchen fan vent pipe that went out through an older, abandoned coal stove 10″ vent in the old roof, originally — the top of the vent had a high “top hat” and huge opening for airflow out, and the inside pipe went right to the top of the outside — never had any blowback from it. The roofers replaced the 10″ roof cap with another 10″ one, new style, low flat top and small openings. They left the old 6″ kitchen fan vent pipe lying on the floor of the attic. I’d caught that weeks ago. I’d gotten them back twice to fix that and thought they finally had — it looked Ok from across the attic. And I’d hurt a knee and been unable to get over to double check it. Finally got my injured knee in shape, in desperation, and clambered over there just now. All they had done was drop an 8″ pipe down in from outside — just covering up the problem. We still had the kitchen vent fan blowing all that moist air through the 6″ opening. Much of it was escaping right at the base, in the space where the 8″ pipe didn’t mate to anything. More was escaping between the top of the 8″ new pipe and the 10″ new cap. (These are flat top caps with little rectangular spaces around them, lots of back pressure I guess. So — for weeks — all that moisture has been going into the attic. I guess all this time it has been condensing in the DensDeck material under the IB Roof and some of it had soaked into the old roof boards (luckily the old roof deck boards are still tar covered in many places, in fact a lot of the old tar paper is still on them). So — I hope — this explains the water that has been trickling back down along the screws. Trust, but verify, as Mr. Reagan said. For now I’ve stuffed plastic bags up around the outside of the 8″ pipe inside the 10″ roof vent cap — not blocking the proper airflow out the top, just blocking the backflow down around the sides. And duct-taped the gaps between the 8″ pipe and the 6″ pipe below that. Air is now flowing out from the kitchen vent fan to the outdoors. I’m running heat and fans to dry out the attic — down to 66 percent humidity now. Still got water trickling down the screws on the north slope of the roof, that part of the DensDeck must have gotten the wettest being both the coldest and nearest the kitchen fan source. I’m still concerned about ordinary condensation under the IB Roof. But I’m a little less worried now that I have an explanation for the immediate large problem. Oh, and we have no soffits at all. The rafters (1923 construction) are notched and sit right on the top plate at the sides. and the roof slopes down to all of the corners at the walls so there’s no flat vertical plane on the end of the attic either. I thought we were getting the IB ‘mushroom’ aluminum vents but apparently the IB rep. decided we were not going to need them – we had stood on the roof and talked about having five of the large ones. There’s a big difference between venting hot air (which really isn’t likely to be a problem in our area) and dealing with moisture condensing at night under a cold roof. Well one last hope is maybe the roofers failed to connect the exhaust fans, I’ll do the crawl to the back of the attic tomorrow and make sure that’s not where the moisture’s coming from. But the copper plumbing vent pipes go right up through the attic and out, they’re plenty cold, and there’s no moisture condensing on them at all – it’s all coming down from the screws that poke through the wood. There were screws coming through before from the old asphalt/tar and gravel roof — but those never dripped water. It’s got to be something happening under the IB roof somehow. Thanks, took me this long to get here again, I screwed up a knee and couldn’t get up into the attic til tonight. I’ll send you some pictures later tonight. It’s mechanically attached, big screws through plates and down through the 1″ boards that make the roof deck here, with a quarter inch of DensDeck under the IB. It’s plain IB, 80 mil, white, edge to edge (we have what they call ‘Dutch gutters’ out here so the membrane wraps up over a 6″ board at the outside, making gutters). I asked repeatedly about venting. The IB factory rep had negotiated something with the city about how much but never told me what was supposed to be there. But out here the inspectors don’t even go up on the roof when they sign off on the work. The IB factory rep got tired of talking to me and just referred everything to the roofer. The roofer came back and put on two 5″ vents through the IB roof (not penetrating through the DensDeck or the wooden roof deck) at the very end because I reminded him that the city insisted some venting was needed. I don’t know if he did what IB told him was right or not, yet — can’t get the IB rep to tell me! Really frustrating. I”ll be asking til I get answers. And I lost most of a month after screwing up a knee, I’m an old guy, so I just got up the attic ladder tonight. I have a lot of asphalt dust and debris to clean out up there, and insulation to get back in place. And — we’ve got water dripping off the screws where they poke down into the attic. It’s about 45 degrees, cold and clear outside. There has always been water condensing aplenty on the outside of the IB material — as soon as the sun goes down — but apparently it has also been condensing all along underneath it, as the screws are all pretty rusty where they stick down through the wood planks that make up the deck. Tonight some of them have liquid water dripping off them. Pretty … well, I shouldn’t use the language that comes to mind. I emailed the IB rep here, and the roofer, and the IB tech representative and will see what they say. The ex-NASA guy who pointed out to me originally that this might happen advises completely sealing the attic — so no moist air can get into it at all. He said that adding regular attic ventilation under a cool roof is counterproductive because the high emissivity surface is a heat pump radiating heat away to the nighttime sky just like during the daytime (except with a colder sink to send it to) — and that letting nighttime air circulate under a cool roof just keeps bringing in warm moist air that will condense on the underside. Others say add more vents (well there are no vents at all right now except the two 5″ IB ones above the roof deck. Another guy said get a foam roof company in to spray the underside of the roof deck with 3″ of foam, except that water can still get between that and the IB and rot out the wood. This has the feeling of being a mistake, so far. Completely sealing an attic can be destructive and dangerous. Moisture will still get in- your house is not a space rated sealed capsule! Moisture will continue to collect and you will be vulnerable to molds, mildews and fungi- and wood destroying insects. It can also badly effect your air quality. I had 2″ iso board lag bolted down to my roof deck but I left in place the old modified roofing so as not to effect the vapor barrier that was already in place. My roof breathes a lot- 7 turbines and continuous soffet venting. It sounds like you are in colder climate so I don’t want to just toss out fixes that might backfire badly. The key is proper roof venting. There are membrane vents – when mechanically fastened Single-Ply woof is installed, having a two-way vent every 300-500 sq. ft. if more than acceptable (manufacturers require one per 1000 sq.ft. to get rid of condensation, but I thin its not sufficient). If roof is fully adhered, than insulation and deck must have a cut, to let air out from attic space through vents such as turbine. This is delicate however – you need to understand air-flow, because you can create short circuit by adding soffit vents. Will you be replying to questions left here? Or can you point to somewhere else to ask? I just got an IB roof put on, reroofing an old house (low slope not flat) after tearing tar and gravel off. I got bids from five roofers for ‘cool roof’ — some shingles, some IB, some combining the two using the IB around the edges where asphalt rots really fast. This goes over an old 1×8 board roof deck with big gaps between boards. All of the bids proposed using a quarter-inch “DensDeck” layer or equivalent fiberglass between the “white roof” and the boards — apparently standard for fire resistance here. None proposed using a layer of foam insulation. I asked each one about adding a layer of insulation thinking why not take the opportunity. All said it was useless and throwing money away, since there is ample insulation on the floor of the attic. I believed them, they were consistent about the answer. But I didn’t know how much water these high emissivity materials condense — it’s astonishing, the roof gets as wet as roofs of vehicles do. Argh. Do the roofers know the area, or not know anything about this high-emissivity material? We rarely get freezing, but we always have about 60 percent humidity year round, near the coast. Under the IB roof, the roof deck on a hot sunny day is about 85 degrees — 25 degrees cooler than under an asphalt roof next to it. That’s with air temp around 85-90 degrees. Dunno what it will do on a cold clear winter night. I’m realizing that if there’s frost on the outside, odds are there will be frost underneath as well. We usually add membrane vents to a mechanically attached IB roof to get rid of the condensation under the membrane. In fully adhered assembly, there is no air space between the membrane and the substrate (DensDeck in your case) so condensation occurs in the attic space. You can also use large (8 inch wide) attic vents to improve ventilation, if you opt not to use ridge / soffit ventilation. I would never recommend using both IB and shingles on a low sloped roof. It creates more problems than saves money. If you want, send me a few pictures of your roof + attic space, and I will have a better idea of your potential issues, and see if I can recommend anything. my email is Leo @ coolflatroof.com (remove spaces). I recently had a front porch built and this included a membrane roof. They put down squares of a foam mat and then layed out membrane over that and secured it along edges with a type of channel that then had plastic or pvc cap placed over it to hide screws. When i walked out in the yard and looked it seemed there were bumps in the roof. When i climbed up to check it they were a few raised places like air pockets. Is this normal with this type installation and material or was it installed wrong? computer, or a dictionary, and have someone else proof-read your page. Once again, is your product available in Indiana (Wabash county area).